With a solo home run against Felix Hernandez in the first inning of today’s game against the Mariners, Jose Bautista of the Blue Jays hit his 50th home run of the season, becoming the first player this season and the first since Prince Fielder and Alex Rodriguez in 2007. Bautista is now the 26th player to accomplish this feat in Major League history. Let’s go deeper into Bautista’s home runs with the help of the fantastic Hit Tracker Online. With a rough estimate of 395 feet on Bautista’s home run today, his 50 home runs traveled a whopping 20,167 feet. That’s 3.82 miles, or roughly the distance of one Adam Dunn home run. Even though the Rogers Centre has probably helped Bautista – it has a 114 park factor for right handed home runs, according to StatCorner, there’s little doubt that Bautista has hit the tar out of the ball this season. His average home run distance of 403.5 feet and average speed off the bat of 106.8 miles per hour are both well above the MLB averages of 396.7 and 103.3 respectively. Yes, Bautista has hit 11 “Just Enough” home runs – those that cleared the fence by 10 vertical feet or fewer or landed only one fence length beyond the fence – but that’s simply a function of the pure volume of home runs he has hit this season. His 18 “No Doubt” homers – those that cleared the fence by 20 vertical feet and landed 50 feet past the fence – are by far the most in the league, with Adam Dunn coming in second with 14. Finally, let’s take a look at where Bautista has hit these home runs. I think it’s safe to call Bautista the King of Left Field this season. 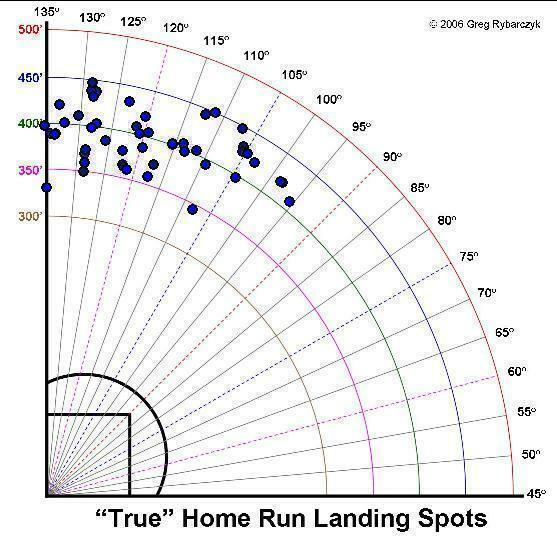 His Majesty’s domain has seen 45 of his 50 homers, with left field defined as those home runs between 135 and 105 degrees on the above chart. The other 5 landed in the left half of center field. Jose Bautista will, barring a minor miracle, lead the Major Leagues in home runs this season after toiling away in relative obscurity for the first six years of his career. Although his 20.9% HR/FB rate is a bit of an anomaly compared to his career numbers, it’s not that out there for someone with solid power in a hitter’s park. Nobody should be projecting Bautista for 50 home runs again next season, but there are certainly reasons to believe that he should continue to be a threat at the plate for the Blue Jays. Congratulations to Bautista on his majestic achievement. We hoped you liked reading Bautista Hits #50 by Jack Moore!